Here is a piece of whole grain bread, full of fibers. Fiber makes your digestion go slower which makes you feel full longer. I like that feeling of not wanting to eat constantly (happens rarely, I’m always hungry!). Whole grains are actually good to lower cholesterol and blood pressure too which is always an added advantage to a meal. 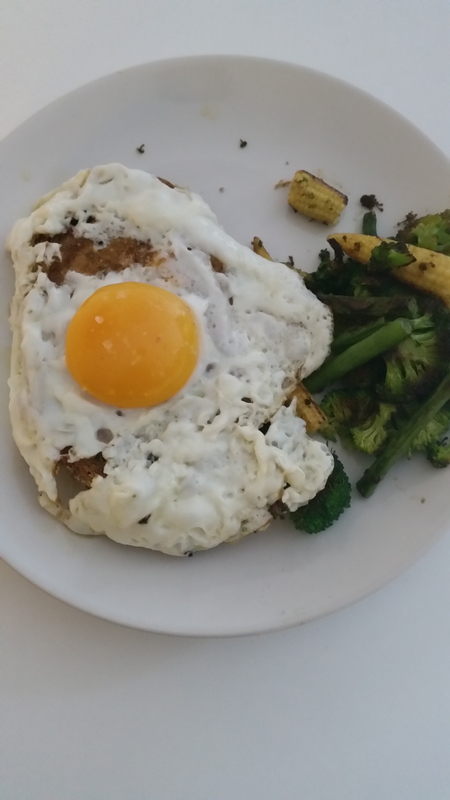 On top of the bread I grilled an egg, which as I have already stated before is filled with vitamins B6 and B12. These two vitamins are mandatory in a healthy diet, B6 helps increase your immune system and gives you energy, B12 is mainly stated as a neurotransmitter and is also know as being good to avoid depression. For the daily vegetables, I grilled baby corn and green beans, high in Vitamin C and potassium and is full of antioxidants. Then boiled some broccoli, which helps prevent against many illnesses due to its boosting immune system agent. Hope you’re all enjoying the sunny days that are coming back! Next Next post: Fashion Friday: Summer is here!